Dark spots, some as large as 50,000 miles in diameter, move across the surface of the sun, contracting and expanding as they go. 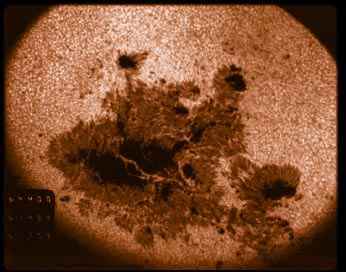 These strange and powerful phenomena are known as sunspots. This resource will allow you to explore the nature of sunspots and the fascinating history of our efforts to understand them. Included here are interviews with solar physicists and archeoastronomers, historic images, modern NASA images and movies, and a sunspot research activity. The "HISTORY" section discusses the importance of the sun to ancient cultures and their understanding of sunspots. The section also details how the development of the telescope began to change our assessment of sunspots. In addition, a simple method for viewing sunspots on your own is included. The development of new technology has increased our knowledge of how the sun works. The "MODERN RESEARCH" section explains what sunspots are and how they affect earth. This site also provides you with the opportunity to do your own sunspot observation and measurement. The "ACTIVITY" section contains a Java application in which you can record the number of sunspots present in both visible light and x-ray images. This web site does not comprehensively cover the topic of solar physics (or even sunspots for that matter!). However, in examining some of the physical workings of the sun we use some terms which may be unfamiliar. To help, a "GLOSSARY" of terms has been included. To see the latest sunspot activity, ttake a quick look at today's solar images from the Yokoh and SOHO spacecraft.